"S-97" redirects here. For other uses, see S97. The Sikorsky S-97 Raider is a high-speed scout and attack compound helicopter based on the Advancing Blade Concept (ABC), under development by Sikorsky Aircraft. Sikorsky planned to offer it for the United States Army's Armed Aerial Scout program, along with other possible uses. The S-97 made its maiden flight on 22 May 2015. Sikorsky's earliest attempt at a fast compound helicopter with stiff coaxial rotors was the Sikorsky S-69 (XH-59A) flown in the 1970s. Its top speed was over 260 knots but its excessive fuel consumption, vibration and complexity requiring the full-time attention of two pilots led to the program's cancellation. These problems were largely solved on another attempt by the Sikorsky X2 technology demonstrator in 2010. First proposed in response to a Request for Information for the Armed Aerial Scout (AAS) program in March 2010, the S-97 was formally launched on 20 October 2010. It was intended as a contender for a United States Army's requirement to replace the Bell OH-58D Kiowa Warrior. Other military roles are possible, the U.S. Special Operations Command having expressed interest in the S-97 as a replacement for the MH-6 Little Bird, and the possibility of adapting it for civilian applications also exists. Sikorsky plans to build two prototypes of the S-97 as demonstrators. One prototype (P1) will be used for flight testing, while the second (P2) is planned for use as a demonstrator. The first prototype was planned to fly in late 2013 or early 2014. Sikorsky started construction of the two prototypes in October 2012. In September 2013, Sikorsky began final assembly of the first S-97 following delivery of the single-piece, all-composite fuselage by Aurora Flight Sciences. In February 2014, construction of the first S-97 prototype was one-quarter complete. Simulated bird strikes testing had been conducted on the fuselage at speeds of up to 235 kn (435 km/h; 270 mph), the S-97's expected maximum flight speed. Drop tests were also performed to ensure the fuel tanks' safety in the event of a crash. Sikorsky is exploring civil applications for the S-97, such as transporting personnel between offshore oil platforms. Sikorsky and partner Boeing are to use the S-97's technology and design process as a basis to develop the SB-1 Defiant, a high-speed rigid rotor co-axial rotorcraft, for the army's Joint Multi-Role Technology Demonstrator (JMR TD) program. The JMR TD is the precursor to the army's estimated USD100 billion Future Vertical Lift (FVL) program to replace the UH-60 Black Hawk utility helicopter and AH-64 Apache attack helicopter. Sikorsky targeted the S-97 for the AAS program, aiming for the helicopter to fly before the Army downselected. Sikorsky invested $150 million and its 54 suppliers (who provide 90% of the parts) spent the remainder of a total of $200 million on two prototypes; production models aim to meet the program's $15 million unit cost target. However, the Army ended the AAS program in late 2013. Budget projections for FY 2015 included retiring the U.S. Army's OH-58 Kiowa fleet and transferring AH-64 Apache attack helicopters from U.S. Army Reserve and U.S. Army National Guard to the active Army to perform the aerial scout role. Sikorsky suggested the possibility of buying the S-97 to replace lost Apache for armed helicopter needs. Sikorsky proposes S-97 as FVL-CS1; the light scout helicopter. On 5 May 2014, Sikorsky opened the S-97 production hangar during the rollout of the CH-53K King Stallion. At that point, the mostly-composite airframe was almost assembled, including some of the electrical wiring and avionics, missing elements were the transmission, drive train, engine, coaxial rotor, and pusher propeller. The S-97's first military customer is aimed to be the U.S. Special Operations Command to replace the MH-6M Little Bird. Unspecified foreign militaries have shown interest in the S-97; it may be difficult to get approval for export for a next-generation helicopter if the US military does not yet have it. The Raider is a prototype, so the first customer would need to finance a production development program. Its avionics were powered on in June 2014, with rollout on 2 October 2014. The S-97 design includes variable speed rigid coaxial main rotors and a variable-pitch pusher propeller, making the S-97 a compound helicopter. Like the X2, it has fly-by-wire control and dynamic anti-vibration actuators to cancel out shaking. The main rotors have hingeless hubs and stiff blades, to improve low-speed handling and efficiency of hover. At high speeds, the close spacing of the hubs reduces drag. The stiff blades allow each rotor to have low lift on the retreating side of its rotor disk (reducing drag), whereas each rotor on a conventional coaxial rotor with "floppy" blades needs nearly equal lift distribution. The propeller relieves the rotor of propulsion, further reducing drag. Maneuverability is improved compared with earlier helicopters because of the ability to tilt the coaxial rotors together or tilt each one differently, and because of the variable pitch propulsor and active elevons[clarification needed]. At low speed the S-97 maneuvers by differential torque of the upper and lower rotor, at high speed it uses rudders. The S-97 will be capable of carrying up to six passengers, in addition to a flight crew of two in a side-by-side cockpit. However, the production S-97 is projected to be capable of flying with either one or two pilots, or autonomously. Space for a targeting sensor has been reserved, however it will not be installed in the prototype aircraft. Based on the technology from the Sikorsky X2 demonstrator, the prototype S-97s will be powered by a General Electric YT706 turboshaft (the same engine used on the MH-60M Black Hawk). A more powerful engine, developed under the Improved Turbine Engine Program, is expected to become available. Compared to the OH-58D Kiowa, the S-97 has significantly increased performance goals, such as cruising speeds upwards of 200 knots while carrying weapons, turning at three times the force of gravity at 220kt, and a high hover efficiency (Figure of merit). Sikorsky also aims for an operating cost of $1,400 per flight hour. On 3 August 2017, an S-97 prototype suffered a hard-landing at the Sikorsky facility in West Palm Beach, Florida; the crew was uninjured. ^ a b c d e Warwick, Graham (22 May 2015). "Sikorsky Conducts First Flight of S-97 Helo". Aviation Week & Space Technology. Archived from the original on 2016-10-30. Retrieved 25 May 2015. ^ a b c d e f Trimble, Stephen. "Sikorsky unveils S-97 for high-speed scout and attack helo". Flightglobal, 20 October 2010. ^ a b c "Sikorsky Commits to Build X2 Technology Prototypes to Advance Military Rotary Wing Operations". Sikorsky, 20 October 2010. ^ a b c Brannen, Kate (20 October 2010). "Sikorsky Plans To Build Two X2 Helo Prototypes". Defense News. Army Times Publishing Company. Retrieved 22 October 2010. The company decided to build two prototypes so that one can be used primarily in flight tests while the second can be available for potential customers to experience, Pino said.... Sikorsky aims to start flight tests in four years. ^ a b c Tony Skinner (25 October 2010). 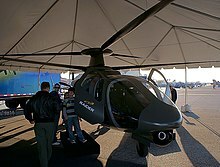 "AUSA 10: Sikorsky unveils the 'Raider' X2". Shephard Group Limited. Retrieved 26 October 2010. ^ "Sikorsky S-97 RAIDER helicopter enters final assembly with delivery of the fuselage from Aurora Flight Sciences". AirFramer 27 September 2013. Accessed: 11 October 2013. ^ Tomkins, Richard. "Sikorsky powers on S-97 avionics" United Press International, 17 June 2014. Archived on 18 June 2014. ^ McGarry, Brendan. "Sikorsky Unveils S-97 Raider Light-Attack Helo" Defensetech.org, 2 October 2014. ^ Judson, Jen (20 April 2018). "Sikorsky modifies Raider helicopter to use US Army's future engine". Defense News. Sightline Media Group. Retrieved 2 February 2019. ^ Wilson, J.R. "Defense Interview: Mark Miller" Defense Media Network, 9 September 2011. Accessed: 4 October 2014. Archived on 2 November 2012. ^ Legendary Liftoff! The Sikorsky S97RAIDER has made its historic first flight. ^ a b "Sikorsky S-97 Raider reaching for top speeds by "summer 2016"". Flightglobal.com. Archived from the original on 13 October 2015. Retrieved 14 October 2015. ^ "As Sikorsky Lockheed Merger Approaches High-Speed Raider Flies Again". aviationweek.com. ^ "Sikorsky S-97 suffers hard landing during flight test". Vertical Magazine. 3 August 2017. Retrieved 6 August 2017. ^ Green, Ronald D. Flight Plan 2011 - Analysis of the U.S. Aerospace Industry, Rotorcraft Developments Archived 2012-03-19 at the Wayback Machine p18, U.S. Department of Commerce / International Trade Administration, March 2011. Accessed: 2 March 2012. Quote: "Several companies--including Sikorsky, Eurocopter, and Carter Aerospace Technologies--are developing compound helicopters to combine vertical/short take-off-and-landing capabilities with one or more propellers for increasing forward speed over conventional helicopter design." Wikimedia Commons has media related to Sikorsky S-97.